When you first dive into the magical world of crystals and their various uses, it can be overwhelming to take in the abundance of information about proper uses, meanings and methods to having a crystal enriched life. 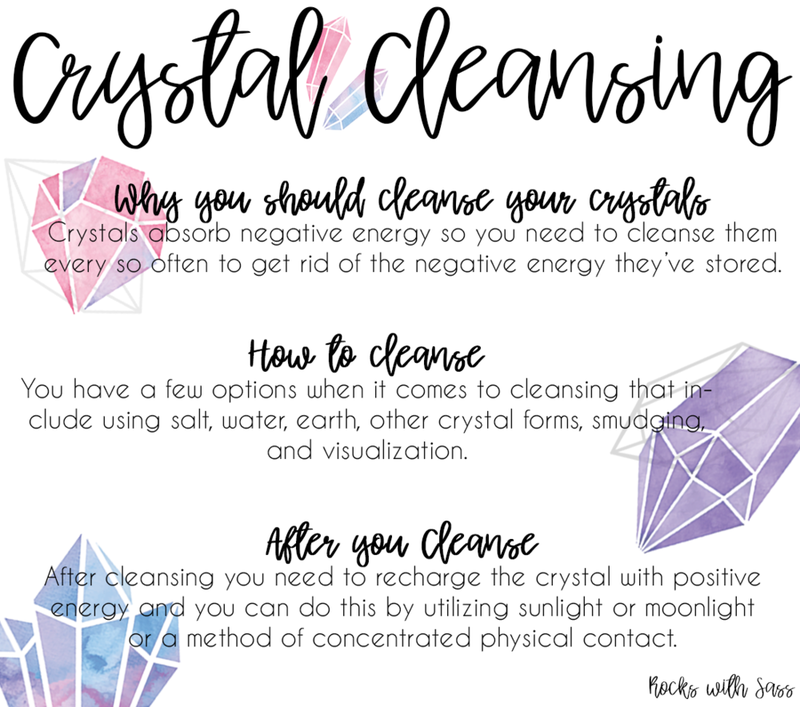 One topic that people have a lot of confusion about is cleansing their crystals; they don’t know how to do it, let alone the reasoning behind it. The purpose of this post is to help you figure that out. As crystals draw out your negative energy, they store it. However, like a flash drive, they can fill up and no longer work as well as they once did. That is why you must cleanse your crystals regularly, so they can continue to properly absorb and release energy. Some crystals do not do well with the use of water or earth, so we will focus on the methods that work well for the majority of crystals and stones. Placing a crystal into an Amethyst or Quartz geode / cluster for 24 to 48 hours is another simple way to cleanse a crystal. Although simple, this method is extremely effective as Amethyst and Quartz will also recharge your crystal for you. Smudging can be done with incense or smudge sticks composed of a combination of sage and either sweetgrass, sandalwood, or cedar wood. Simply ensure the crystals are exposed to the smoke for 20-30 seconds and you have successfully cleansed your crystals. You can program a crystal after any cleansing by holding the crystal for a few minutes and focusing on the power you want to enhance in the crystal. After you cleanse the crystal, you need to recharge the positive energy as cleansing leaves the crystal essentially blank. You can recharge the crystal by leaving it in direct moonlight for one to two nights for a gentler energy or sunlight for a stronger energy. However, be warned that the strong sunlight can change the colors of crystals, so use sunlight near sunrise or sundown to reduce damage. You can also recharge a crystal through positive physical contact. The Native Americans believe you can use your own energy field in order to recharge crystals. Think positive thoughts while you handle the crystal and allow your energy to flow into the crystal for a few minutes. Overall, cleansing your crystals is an important yet simple process that helps you fully utilize their energetic abilities. How often you cleanse will depend on your level of use, but once a month will do for the average user. Remember to research the types of crystals you have before exposing them to certain cleansing methods to prevent damage.